click on the links above to discover more about selden research limited. selden's commitment to ethical, environmentally sound production methods ensures your purchasing will be guaranteed green. For information regarding Selden's latest additions to the product range click here. 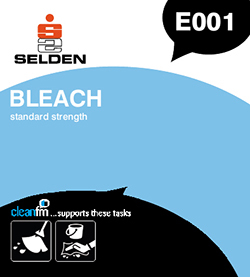 Download datasheets and coshh information for the Selden product range. A range of products forming our MLCP (Multi-Lingual Cleaning Programme). Supported by wallcharts and product guides for the modern contract cleaner operating in today's multicultural environment. the selden news letter. subscribe online. selden lead the way in advanced cleaning solutions. iNform supports these products with advice and guidance in the form of literature and our interactive software. Disinfects and kill germs on most hard surfaces, eradicates malodours at source. Keeps drains and toilets clean and sweet smelling. A powerful bleach effective against a wide range of pathogenic organisms. Drains, floors, lavatories and for general disinfecting and cleaning. All surfactants contained in Selden Products meet the requirements of the EU Detergent Directive 2005 – 2004/648/EC. This requires all surfactants to break down both quickly and completely into harmless material such as CO2 and water. All biocides/disinfectant/preservatives contained within Selden products fully comply with the EU Biocidal product Directive 98/8/EC, ensuring a high level of protection for humans, animals and the environment. Product is for professional use only.